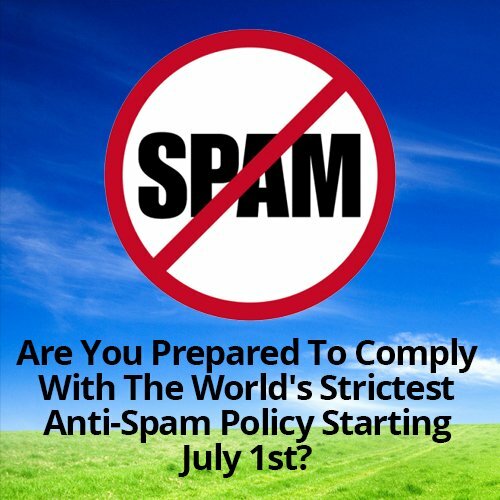 Are You Prepared To Comply With The World's Strictest Anti-Spam Policy Starting July 1st? On July 1st, there’s going to be some significant changes implemented for business who incorporated promotional emails and monthly newsletters into their marketing plans. These new rules are targeting email spam, and they will have quite an impact on many small businesses. Known as Canada’s Anti Spam Legislation, or CASL, it’s being referred to as one of the strictest anti-spam policies in the world, and its main purpose is to help combat identity thieves, phishers, and those that send mass amounts of unwanted emails to online users. Unfortunately, it will also have a detrimental effect on the marketing efforts of many Canadian businesses. It’s crucial that you take the proper steps to be prepared for the changes that will be implemented on Tuesday, July 1, 2014. New Email Marketing Laws In Effect Starting July 1st- What’s New? What’s Changing? These strict changes are bound to be a tough adjustment for all business owners. We recommend that you work on getting express consent from your email recipients as soon as you can to help prepare your business for these new anti-spam laws. Another great idea would be to prominently feature an unsubscribe link or button in your weekly or monthly email newsletters. To help answer any questions you may have about the new CASL’s anti-spam rules, click here to check out a detailed and informative FAQ that they’ve published on The Government Of Canada’s official website. This entry was posted in Online Marketing and tagged Anti-Spam,Canada's Anti Spam Legislation,email marketing,Email Marketing Law,Law,Marketing,New Canada's Anti Spam Legislation,New Canadian Anti-Spam Law,Online Markteing,World's Strictest Anti-Spam Law on June 23, 2014 by ReferLinks Online Marketing.